There are numerous museums all over the world and it seems that whenever there is a museum, there will also be hotels. If you love traveling and art, here is a list of the world’s best hotels for art lovers. The Minos Beach Art Hotel is one of the finest hotels in Crete. It has a seafront setting and is located near the Agios Nikolaos Archeological Museum and Lake Voulismeni. It offers bungalows, suites, and villas to tourists wanting to get away from the hustle and bustle of the city. The hotel also serves as an art gallery, displaying sculptures from leading Greek and foreign artists. Baur au Lac is one of the world’s best hotels, maintaining the top position in the international luxury hotel industry for more than 165 years. The posh rooms offer spectacular views of the Swiss Alps and Lake Zurich. The hotel organizes an outdoor sculpture exhibition called Art in the Park where world-class artists display their works on the property’s grounds. Art pieces of Robert Indiana, Joan Miro, and Sol Lewitt have been included in this twice-a-year exhibit. 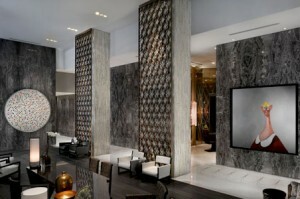 W South Beach is a resort hotel that also displays museum-caliber art pieces. The selection owned by the hotel’s co-owner Aby Rosen and the pieces are from modern artists like Francis Bacon, Andy Warhol, and Jean-Michel Basquiat. The hotel is located close to the Bass Art Museum which recently opened the exhibition called “From Picasso to Koons: The Artist as Jeweler,” an exhibit showcasing around 200 works by 135 artists. New York City boasts hundreds of museums, making it a haven for art lovers. The Gramercy Park Hotel has an impressive selection of art pieces. It houses the work of world-class artists such as Andy Warhol, Richard Prince, Keith Haring, Julian Schnabel, Jean-Michel Basquiat, and Damien Hirst. Hotel Siru offers 101 unique rooms. In the 1980s, the hotel commissioned 130 Belgian artists to work on the rooms so now, all the rooms and public areas features contemporary works which includes framed prints, 3-D papier mâché sculptures, and murals. If you’re staying at Hotel Siru, try and visit the Centre Belge de la Bande Dessinée or the Comic Strip Museum. 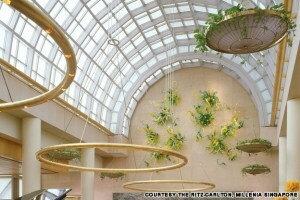 The Ritz-Carlton commissioned art pieces worth S$5 million dollars which are positioned in the best feng shui locations. A detailed map will show you the location of all 4,200 pieces on display which includes the works of Zhu Wei, Dale Chihuly, Andy Warhol, Frank Stellar, Henry Moore and David Hockney. The Merrion Hotel not only offers the finest accommodations in Ireland, it showcases the work’s of the country’s most important artists including Daniel Maclise, Nathaniel Hone, Paul Henry, and Mainie Jellet. Guided tours are available from the National Gallery. Images are from here and here.